For the last four months, I’ve been part of a team looking at the big-picture problems of public transport in Sydney, sponsored but not controlled by the city’s main newspaper, the Sydney Morning Herald. We released the draft report today, so I can finally talk about it. Transport has been an area of controversy in Sydney for years. The state government (which is responsible for most planning and infrastructure) has developed a pattern of announcing major rail projects only to cancel them a year or two later, leaving the impression that there is no big-picture strategy or integrated plan. Sydney also suffers from a lack of coordination among different transit providers. Plenty of people work on planning better buses, or better ferries, or better trains, but not many people are responsible for planning a single transit system where all these services work together, nor do they have the power to make it happen. The public transport task in Sydney is huge. The metro population is around 4.4 million and headed for 6 million in 30 years, so a difficult density-vs-sprawl debate is ongoing. Sydney has an exceptionally dense Central Business Disrict (CBD), where more than 70% of workers currently arrive on public transit. This doesn’t mean transit is wonderful, only that driving is worse. All-day parking in the city can cost over $60/day. When it comes to public transit, Sydney seems stuck. Over the last decade, Melbourne, Brisbane, and Perth have seen dramatic ridership growth, but Sydney’s has been flat. The public view of Sydney’s current transit offering is decidedly negative. Public transit in Sydney is seen as an unfortunate necessity, not as a positive feature of a vibrant global city. Our project was led by Ron Christie, a former Coordinator General for Rail and former head of the Roads and Traffic Authority, who will always be remembered as the successful director of transport services for Sydney’s 2000 Olympic Games. Ron convened a diverse group of academics, consultants, and retired public servants to conduct the inquiry, and the draft report — almost 500 riveting pages — has now landed firmly in the public domain, with a large splash in the weekend Herald and local television coverage on Saturday. The report can be downloaded here. Public Transport over Roads. The Inquiry finds that the Government’s recent priority on increasing road capacity into the City makes little sense, either technically or politically. Technically, increased road capacity simply delivers private cars into the city faster than the city streets can absorb them. More remarkably, the public understands this, and is ready to halt major road investment. The Inquiry included a statistically valid public survey of 2400 residents, conducted through the University of Technology at Sydney, finding overwhelming support for public transport rather than roads as the main investment priority. Governance. 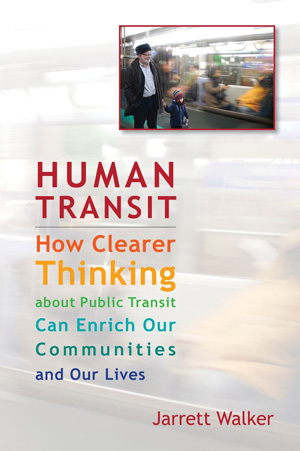 (Chapter 6) Public transit, we argue, needs to be run by a public transit agency with a bit of distance from the daily to-and-fro of state government, and with control over all the key pieces of the puzzle, including fare policy, network planning, quality control, and infrastructure investment. We suggest calling this agency Transport for Sydney, in honor of the Transport for London model. Fare Integration. (Chapter 3) Sydney is one of few developed-world cities that charges a new full-fare every time you make a connection. This has prevented the design of simple, frequent services that could form a versatile network. Instead, we have bus lines that duplicate train lines, too many buses crowding into the CBD, and not enough crosstown or orbital services into the many other employment and activity centers around greater Sydney. Major Rail Investment Priorities. (Chapter 2) Government in the last three years has become enamored with the driverless metro, similar to Vancouver’s Skytrain. Unfortunately, proposals for this excellent technology have come into conflict with the need to protect and enhance the extensive rail system that already exists: an electrified commuter rail network, with extensive subway stations in the CBD, that could itself become more like a metro if it were managed to deliver higher all-day frequencies. Much of the hard work of the Inquiry has been in taking apart the “metro” idea, identifying all the ways that the existing rail system can do the same thing, and thus determining where entirely new metro lines really do make sense. Short Term and Continuous Improvement. The inquiry devotes Chapter 4 to all the little things that can be done now, or soon, to make things better, including rail frequency increases, bus restructuring, new information systems, and a range of other low-cost changes that would transform transit’s usefulness even as the city waits for the big rail investments to come. Finance. (Chapter 5). Finally, we know how to pay for it all. The public survey explored in detail the public’s willingness to pay new taxes and user fees, including household levies, fares, CBD congestion charges, and carbon taxes on petrol (fuel). Finance experts from Allen Consulting laid out a financial plan showing how these sources, at levels that got majority support in the survey, could add up to the total cost of capital, operations, and financing for the 30-year program of transit improvements. I did much of writing in the chapters on fare integration and short term improvement, and took the lead on bus network planning, but the entire Inquiry represents both Ron’s view and the result of spirited debate within the group. Sooner or later, some state government is going to implement most of these recommendations, because they are in line with what most similar cities around the world have found they need to do. Even here in Australia, Brisbane, Melbourne, and Perth all have integrated fares. Brisbane and Perth also have the semi-autonomous urban transit agency that we recommend. Obviously, there’s a lot here. I hope Sydney’s many opinion leaders will take the time to digest it. Sydney has seen a lot of grand plans, but this one is unusual in the level of effort, the sponsorship of a major newspaper, and the detailed research about the public’s willingness to pay. It might lead somewhere. I hope it helps someone get home. How Do I Become a Transit Planner? I’ll have to at least read the executive summary. 500 pages is a bit daunting even for me to get though! Do you have a citation for the statement that Sydney’s transit ridership hasn’t grown? A few threads ago I gave a link to a travel to work survey done by the government, which states that Sydney’s transit mode share has risen from 19% in the late 1990s to 24% today. More on topic: I haven’t read the report yet – I started with the recommendations. I’m going to read the sections about what Sydney can learn from other cities soon. It's in Chapter 2 of our report (see link in post) bottom of page 74. It looks like this is data kept and reported by UITP in Canberra. It shows that total patronage in 2009 was up only 4% from the 1999 level. This is all trips, so it may not track with mode share. This is outstanding Jarrett. Congratualtions to the entire team involved. Any idea if Fairfax is considering sponsoring one for Melbourne? The Age has done well to cover transport issues in the city. A similar inquiry would make a lot of sense. Thanks, K. As far as I know, this was driven by the Sydney Morning Herald in particular, rather than by Fairfax's corporate level. You could certainly suggest the same thing to their peers at the Age. God bless Fairfax! Without it this would be a shell of a country (refer Adelaide). They have always been the government watchdog. Now they are its public service too! I had no idea they had the capacity to engage high-paid consultants for four months! They must be selling more click through ads on smh.com.au than i realised! These look like great suggestions! I look forward to riding Sydney’s PT with a smile before I grow old and die. Interesting to see the local perspective on it. I was in Sydney for a week about two years ago and found the transit to be quite good (maybe that says something about the poor expectations of an American transit user?). I bought a Green Travelpass and was able to travel anywhere within two fare zones on any mode at no extra charge. I paid an incremental fare for a trip to the Blue Mountains. It was very convenient and easy. I guess they need to get that kind of convenience for the locals as well as the tourists, although it appears that is what the “MyMulti” pass does. John. Yes, Sydney treats tourists much better than it treats locals! If you’re here for several days, or if you commute every day, the TravelPass can simplify things. Unfortunately, if you just make spontaneous trips of varying lengths as part of a car-free life, there’s no similar instrument. Surely the state government could choose an utterly self-destructive, self-defeating, unpopular plan, be voted out, and have the subsequent government renege on its promises in order to commit to another self-destructive, self-defeating unpopular plan? And this could repeat until the total collapse of the city as people and businesses flee? Hey, it’s happened elsewhere. I was thinking about asking you about transportation in Syndey… seems like my question (and any other question I could possibly come up with) is answered! Jase: Perhaps the consultants weren’t highly paid, even if they deserve to be. I’d like to see these (and certainly future) reports formatted to landscape so it is easier to read full pages on a computer. And ePub version would be nice too as the issues require careful study (while commuting?). Having read the double deck v single deck carriage chapter, I was blown away by how brilliant was the original design of the double deck trains (as amended) for Sydney travel patterns. I was concerned by the extent to which politicians have effectively mandated “metros” and bullied public servants and consultants to sing their praises in harmony when they are clearly inappropriate. We have lots of eggs in Town Hall station when it come to capacity issues but this seems to have been ignored by Nathan. How much other policy work in other areas is done this way? So much for frank and fearless advice from Public Servants. Cabs are still a major transport artery in town. some have even evolved into entertainment zones. Like the Cabbie-oke cabs that have started hosting non-singers and amateurs on karaoke for their official YouTube channel. funny eh? ?